We thought Donald Trump did awesome in the previous presidential debate between him and Hillary Clinton, but his poll numbers are perilous anyway. That's a direct result of the mainstream media focusing on absolute garbage and falsehoods about Donald Trump, instead of focusing on the actual issues that matter. (And on those issues, Hillary loses every time.) If they were at least unbiased and still garbage, they'd give equal time to Hillary and the Democrat Party's criminal/ethical issues, but they're not. They're totally biased and rigging everything. ...And we've been too focused on talking about videogames to give you a play-by-play of the news you'd miss if you only got your news from the mainstream media. That's why we tell you to look at certain other websites! First of all, Chris Wallace was easily, EASILY the best debate moderator of these debates. He kept the audience AND the candidates mostly under control, asked legitimate questions, and wasn't biased against the candidates! He had the best performance of the night. You can watch why Hillary was very upset about maintaining Second Amendment rights here. Despite that, Hillary made herself look like a smaller-government person than Donald Trump, especially on abortion when she said the US government has no business making choices for people. Sure, Trump is correct on the policy, but the way Hillary presented it probably looked better to whoever the hell is undecided. That applied throughout the night. 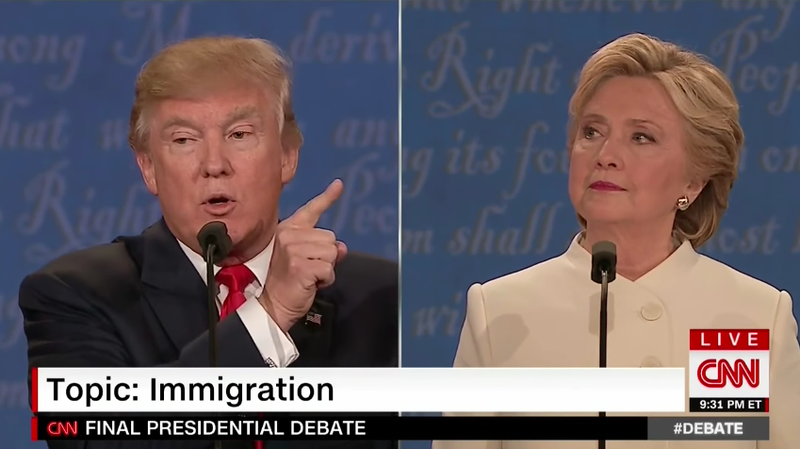 Trump did much better on immigration, stating that there are some “bad hombres” out there. All Hillary had were planned anecdotes to avoid her terrible positions and flip-flops. Then she denounced Trump's position by mischaracterising it, while then saying that she has the equivalent of what Trump's actual position is. Trump declaring that THE WALL was Hillary's idea. Hillary Clinton chose to rant about allegations that Russia is influencing the election to avoid her support for open borders that she expressed in the Wikileaks-revealed speeches she gave. She believes Trump is a Putin puppet, and Trump said she's a liar, like she always is. Well, he's right about that. For the first time, Hillary name-dropped Bernie Sanders, and they briefly fought over who gets his voter base. I don't think that's a fight Trump can win. Soooooo, Trump also said we'll have “more free trade than we do now!” Well, that's nice. Hillary claimed “I will not add a penny to the debt.” That's nice, too. Too bad it won't come true. Believe me. Donald Trump apparently believes everything is rigged. And, hey, it's true. There's so many articles I've linked “the rigged article” from! That's a “dark, dark vision” according to Hillary. I think it's the truth. The media is rigged against him. The fact she's able to even run for president is rigged, with her “criminal enterprise” Clinton Foundation. 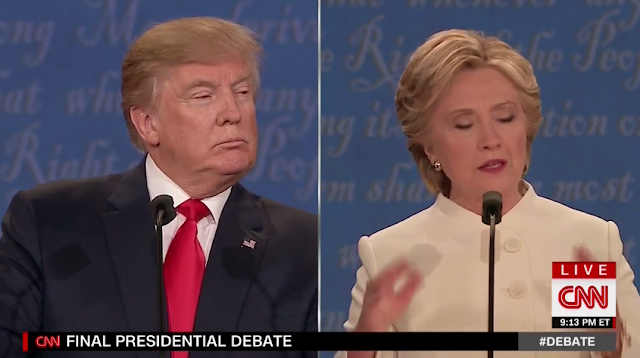 She just totally avoided the question about the truth that the Clinton Foundation is a pay-for-play deal! Then Hillary said she's fully aware of the problems of implementing a No Fly Zone, but she didn't seem to particularly care about the threat of beginning World War III, muttering about making a deal with Russia that will involve shooting down Russian airplanes without Russia retaliating. Come on, everyone knows Trump is right that Hillary is total garbage in making deals. Like she'd ever pull off that. Disappointingly, neither candidate had anything coherent to say about reducing the National Debt. Donald Trump had a “We'll grow ourselves out of it.” response while also saying he'll repeal Obamacare to solve Social Security and Medicare's insolvency. ...Yeah, so, that doesn't make sense as an answer. Hillary kept saying she won't add a penny to the debt because she'll just keep raising taxes on people, while increasing Social Security benefits. ...Dumb. Well, according to our scores, Team Trump had his worst performance, and Team Hillary had her best. In the interest of transparency, Rawk believes Trump had his best debate performance ever. That's just a ploy from him to get me to give the Trump campaign more money. (I owe it $27.06.) He thought Trump's statement about NOT accepting the results of the election was “pure poetry”, referencing the first Republican primary debate, which also featured Chris Wallace, when he refused to support the Republican nominee if he wouldn't win. Ludwig wrote everything before the page break before the debate. With this article done and no more debates, KoopaTV still is not finished in its mission of trying to take down Hillary Clinton and have the United States elect Donald Trump. If the country fails, then KoopaTV itself could be finished. Help prevent that from happening. ...What did YOU think about the debate? For a whole article on why Hillary's foreign policy is extremely dangerous, click here. Ludwig was serious about KoopaTV being finished if the country fails. Chris Wallace definitely won the debate. It's too bad he isn't a candidate, though. Hey, we're a gaming site. It should be natural for us to gravitate towards the dude having the most fun and games. Anyway, Trump has said he reserves the right to legally challenge the result of the election if there is any sort of fraud. And keeping your options open, rather than taking it off the table, is the smart thing for a world leader to do. If there IS fraud — and there's evidence of the Democrats admitting their intention of it — why should he accept it? The reason I still scored Trump lower is that his expectations were very high, since he's behind and it's the last debate. I wanted him to talk even more about Wikileaks, Project Veritas, and the FBI stuff. The mainstream media hasn't been talking about those very important things, and the one chance that Americans who just watch the mainstream media would have to be exposed to the truth was that night. Instead, Trump vaguely referred to it as "the clips", which doesn't help people in knowing what to Google after the debate ends. Well, yeah, they're edited. There's gotta be a curated version to show or no one's gonna watch a year's worth of raw footage. Being sued (and even paying a settlement) doesn't necessarily mean you did anything wrong, and it doesn't prevent you from doing legitimate things in the future. Hillary didn't exactly deny any of the information from Wikileaks or these videos from Project Veritas, either. Instead, she just changed the subject to talking about how Trump is somehow a Putin puppet. As for your list of Trump crimes, those aren't worded as "proof" but "allegedly" or "may have". With the specific charge to Trump supposedly inciting Russia to hack Hillary, he was specifically saying that, if Russia has ALREADY hacked 'em, they might as well release the information. Not to hack them again, or for the first time. It was a joke. Our problem with Hillary and her allies is that she wants to charge people with treason for being humourous, and that goes against the very core values of this site!